As you know a Class diagram is a diagram showing different classes in a system their attribute, operation and the relationship among different objects. Even I have been using it for long time; I always had confusion each time when I use it. This post is meant for such people; also it will be helpful for beginners, here I will explain the class diagram with C++ class example. 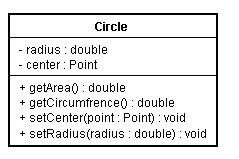 Class diagram for the above class is shown below. “in” The parameter is an input parameter. “Inout” The parameter is capable of both input and output. “Out” The parameter is an output parameter. 1) Static members are represented as underlined. 2) Pure virtual functions are represented as italics. In a system a class may be related to different classes,following are the different relation ship. One object is aware of another; it contains a pointer or reference to another object. Aggregation can occur when a class is a collection or container of other classes, but where the contained classes do not have a strong life cycle dependency on the container—essentially, if the container is destroyed, its contents are not. You may have confusion between aggregation and association .Association differs from aggregation only in that it does not imply any containment. A Rectangle class has its style, which may be shared by other shapes also; life time of style doesn’t depend on Rectangle class. In Inheritance relationship a class is derived from another class. It is a “is a” relationship between two classes. Here X and Y are normal classes. Here Shape is an abstract class that is why it is shown in Italics. Draw () and Erase () methods of Shape class is pure virtual function, so it is also shown as italics. Template class mean generic classes.Languages like C++, java, C# supports generic programming. In the description you talk about assossiation as that an object “knows the other”. In the code I see a stronger relationships. For example you call Foo() in void f() which would seem more like a dependcy relationship. I also see that you have a member Y *y_ptr which I would seem that there is relationship aggragation. here “Y *y_ptr ” in class “X” doesn’t have any life cycle dependency(composition) nor it implies it any containment(aggregation); so it is an association. Association differs from aggregation only in that it does not imply any containment. if “Y *y_ptr” then it is Association because X contains a “reference” (pointer) to Y which means that Y have to exist independent of X in order to have a reference to it. if “Y y” then it is Composition because X contains an object Y whose existence depends on the existence of X.
if “vector y” then it is Aggregation because X has a “container”, in this case, a vector, of Y.
case 3:if X contains vector; and construction and destruction of Y* not happening inside X (in constructor/destructor) then it can be aggregation/Aggregation based on the scenario. Yes! 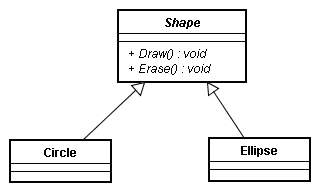 Finally a decent post about UML C++ diagrams that is straight to the point! Enjoyed the blog. Nice reminder in the class relationships paragraph. Good work. This article is very helpful! I wish, though that objects used had more visual examples to help visualizing the objects. Gives visual reference to explanation. Thanks for the helpful article Sadique. I appreciate it. I think there is a mistake in the very first class diagram. The connection drawn between the Vehicle class and the Wheel class is wrong. You have the white diamond drawn at the Wheel class, when it should be drawn at the Vehicle class. The Vehicle aggregates the Wheel, not the other way around. This are all the possibilities of interactions between classes?